Rose of your heart. The unique beauty of this necklace won't fade away. 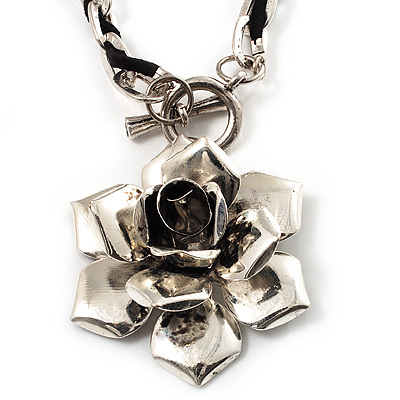 Featuring a 3 D blooming rose pendant (about 5.3cm in diameter) made of burn silver metal. The pendant attached to a chunky metal rolo chain intertwined with a black leather cord for a quirky style. The necklace measures about 38cm in length and secures with T-Bar in front of the necklace. A simply stunning gift to express your love.